One of the best things about good but underrated PC games is that they often end up being given away free a few years after launch. 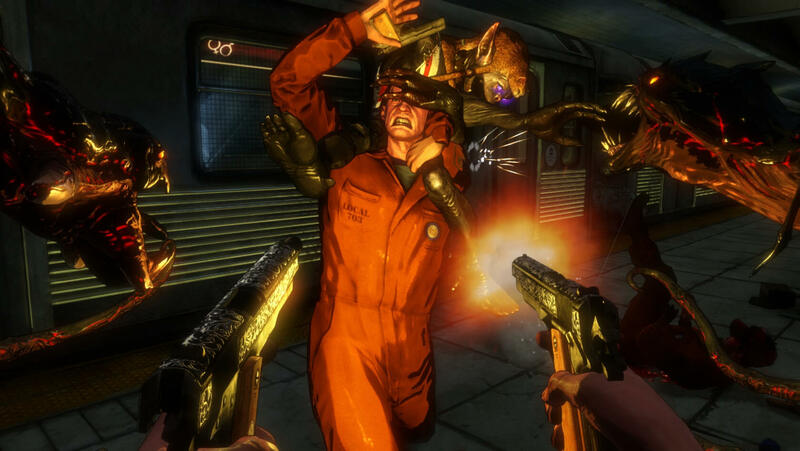 The Darkness II, an enjoyable title that flew under many people’s radar, has joined these ranks. It’s available for nothing right now over on the Humble Bundle. But you better move fast: the offer won’t be up for very long. The Darkness II is still $29.99 on Steam, where it has a ‘very positive’ rating. It’s the sequel to the excellent 2007 FPS game, which was only released on Xbox 360 and PlayStation 3. Both titles are based on the comic book of the same name; they following Jackie Estacado, a mafia hitman turned crime boss, who possess unholy abilities thanks to a demonic force that has inhabited his family for generations—the Darkness, which is voiced brilliantly in the games by former Faith No More singer Mike Patton. While the 2012 sequel did make its way onto the PC, it wasn’t quite as ground-breaking as its predecessor and didn’t get the amount of attention it deserved. But it’s still a fun, arcadey shooter that’s an enjoyable way of spending some hours. And Jackie’s often brutal powers are great to play about with. You’ll need to make a free Humble account to get the game, which comes in the form of a Steam key. Best hurry if you’re interested: the deal is only available for another 30 hours at the time of writing. Good freebie. Mouse sensitivity is crazy high, though. Dang yo, was about to get this if only there was some kind of mouse sensitivity option. I might check this out, considering I've never heard of it before. I have it set to minimum. This is a known issue with the PC port. Haha, just giving you a hard time. But I finally tried it out... it is high, but its not bad. I play with my DPI settings pretty high by default. So maybe it's just something I'm use it. My mouse is stuck at 10,000 (it’s a razer product, don’t ask). Fine in most games where I can properly adjust the in-game setting, but here it’s...well, let’s just say it’s sensitive. You can also try adjusting the Windows settings for mouse sensitivity outside of the game, if only for while you're playing the game. Basically slowing down the general API. Whether the game communicates directly to the mouse through direct-to-metal communication or that it uses the Windows supplied command set.